Melbourne the most livable city in the world is the capital and most populous city in the state of Victoria in Australia. I was introduced to Melbourne during my childhood by Indian Cricket Team's tour of Australia. 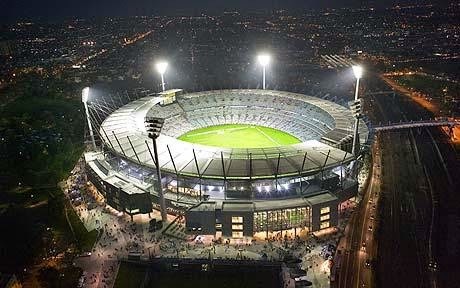 The Boxing day(26 December ) test held in Melbourne Cricket Stadium (MCG) was my first memories of that place. I knew then that we have only Eden Garden in Kolkata, India which is closer to its size and capacity. It is among the biggest and known stadiums in the world. The broadcasting channels used to show us the glimpse of Melbourne city in between the cricket telecast. This seaside city have beautiful roads, lovely beaches, high rise sky scrapers, trams, kangaroos,etcetera which all were etched in my memories even before I got access to the Internet and searched them there. Later I found that Melbourne tramway network is the largest in the world and among the oldest. Melbourne is always the front runner for major events in Australia like Cricket world cup matches, commonwealth games , Olympics,etc. Every year we also witness the great fireworks show in Melbourne city to welcome new year on eve of 31st December. Now I know much more about this financial and cultural center. There are many reasons to fall in love with it. Melbourne has world's one of the best coastal drives in the form of Great Ocean Road where you can have surf breaks and kangaroo sightings. Phillip Islands where one can experience penguins, you can do ballooning over vineyards in Yarra Valley or explore uniqueness of Grampians, it's streets are perfect hosts to clubbing ,entertainment, shopping and eating points. A place where one can taste delicious food and yes there are also restaurants for Indian food. In all its a perfect holiday destination with family or partner or alone and being one of the host city of Cricket World Cup 2015 I think this is the write time to plan a trip for Melbourne. Question: Which of these places would you want to visit in Melbourne and why ? After watching all the videos I think I like 'Sunny Ridge Strawberry Farm' the most. I'm fond of strawberries and I have a special liking towards farms cause I love the silence and the fresh air. The green scenery is also breathtaking. So I thing I fall for that place. I wrote the last line by mistakenly... So I *think I fall for that place. Great post! I’d most like to visit the Dandenong Ranges for it’s scenic beauty, breathtaking view and cool breeze blowing through my hair. :P I’d give anything away for driving through the winding roads which are present throughout the ranges. I’d love to stay at one of the bed and breakfast cottages and go on frequent excursions in the forests with my camera which provides excellent views. And not to forget the famous ride in the Puffing Billy, a day reserved especially for that. To add to that, there are also several picnic spots for me and my friends to spend a fun-filled day and the ranges are a perfect spot for hiking and cycling. After watching the videos of Rohan and Tanmay enjoying Melbourne, I am really feeling jealous of them and I would definitely love to visit the lovely places which they visited at least once in lifetime. Out of the places I seen in the list, I would definitely want to visit the Eureka Skydeck which is at breath taking height and I would feel like I am on 'Top of the World' for sure. Watching the view from that height is one is a life time experience for sure. God ! Please grant my wish to visit Melbourne at least once in my life.